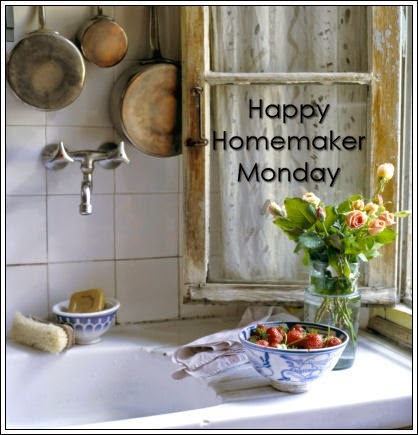 I have a few extra minutes so thought I would pop on with Happy Homemaker Monday! Thank you for being so patient with my sporadic blogging till July 1. I look forward to getting back to some regular blogging again! Sandra, our weekly host for Happy Homemaker Monday, just finished moving! I hate to move and so admire how she was able to move, keep her family running AND blog about the process!!! She is amazing!!! You can check up on what she's doing at Diary of a Stay at Home Mom. We have a cloud cover today with a light breeze. The temperature is a very comfortable 84 degrees (F). Our garden is amazing and the flowers are beautiful! I am so blessed to live where I do. Taking a break from laundry and housework by blogging and drinking a glass of iced tea. I have been thinking about card ideas. No surprise, right?!!! I need to make 3 Thank You cards, 1 Birthday card, 2 swap cards and 3 Design Team Projects this week. Ideas are running through my head but I need to start putting them on paper! Books, books and more books! I could make a Jenga Puzzle out of the books! Also a stack of napkins; I am a napkin hoarder! So, what are the napkins doing in my bedroom? Good question! Our TV is in the bedroom so I often eat my lunch in the bedroom and put the gently used napkin on the beside table to reuse. The problem is that the next day I get another napkin. You see the problem, right?!!! We have been watching Royal Pains on Netflix. The wind just picked up; no longer gentle! Also Rocky is snoring beside me. No menu:( Hubby and I are experimenting with Intermittent Fasting. The method we chose is 3 days a week of 500 calories (hubby 600 calories). On Monday, Wednesday and Friday we eat one meal about noon with 500/600 calories and that's it till the next day. On the other 4 days we just eat normal. We just started our 2nd week. I am making a baby afghan for a baby girl to be born in October! I wanted to start making my own foaming hand soap so we were looking online for a good pump that wouldn't stick or quit working in a short time. The more I read the more I realized the best pump already has soap in it...Method! So we bought enough containers of Method Foaming Hand Soap. I will have to wait till the containers are empty to make my own but thought it was interesting that you can't purchase a better pump dispenser. It looks pretty good around here. The dogs are lying on the floor at my feet; the cat is on the back of my chair. The Clematis is beautiful this year! Well, that's it for today! I hope all is well in your world! Hi Kat - Happy Monday! I have been making my own foaming soap for years using "recycled" foaming soap dispensers that I purchased foaming soap in. I have been using the same soap dispensers for years with good results. Your fasting diet sounds interesting. Are you and hubby trying to lose weight? Please let us know how the fasting diet works. I have only fasted for spiritual/religious reasons in the past, but I know it does cut down on the calories. Good luck making your cards. have a good week! We are loving our Method Foaming Soap! The dispensers are the best we have tried so far. When they are empty I will make my own foaming soap with Dr. Bronner's soap. I will post more about the Intermittent Fasting diet in about a month; want to give it a little more time. And yes, it is to lose weight. Thanks for stopping by! I would love to be able to do a fasting diet, but I don't know if I could. I can't fast for 24 hours but this one seems to work good for me...so far anyway! I will keep you posted! Blueberries would be more than welcome right about now! We didn't end up going for blueberries:( We will have another chance when they come on near Portland. I do love berries...all berries!!! Even Gooseberries!! !